Confirmation gift was the beginning of a new family hobby. When Stine was confirmed in 2015, she had her greatest wish fulfilled. She was even allowed to choose a pug from Kennel Adeltand. It was Pug Antony, at 8 months, she fell for. When we picked Antony, we were told that he could be exhibited. He would probably not stand in the first row, but if the color of the loop was didn't matter, it might be fun for us to try. My first reaction was that it was not for us, but there were still aroused interest and curiosity in me. Antony had exercised and cared for, and an exhibition could be a motivating factor in daily life. While Antony fell in our home, we began to study a lot of exhibitions and we started going to ring training in a small local show training association. All beginnings are difficult. Antony would rather sit and look at the other dogs, but we were encouraged to continue, and soon went better. Stine also began to participate in junior handling. It was with great pleasure I could feel that the little dog brought joy and new community in our family. Mondays were Stine's and my night we went to training with Antony and the exhibits were something we all three looked forward to. Slowly I got a dream for an extra mops, so Antony could get a playmate, and Stine and I both had a dog to train - and so it was. In September we got Adeltands Mighty Monty. 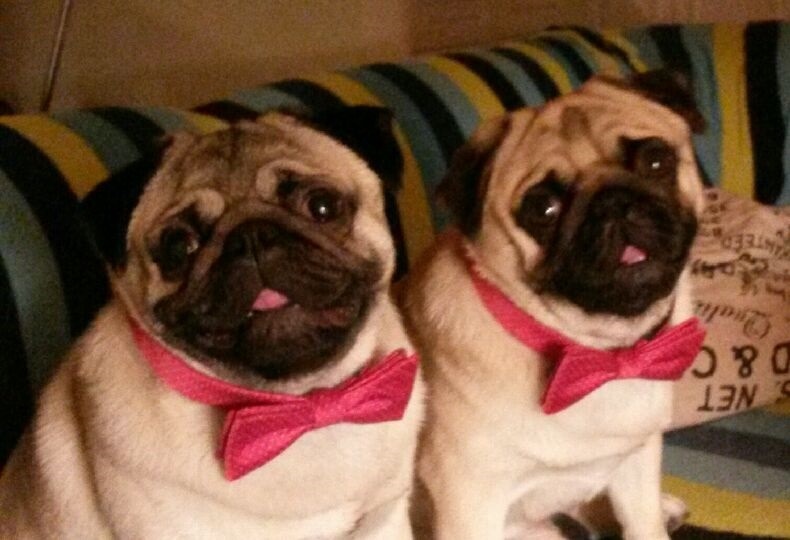 Our two pugs now fills much of daily life - but what luck. All the sacrifice, you get well again. There is not a day where we do not laugh at them. Exhibitions have become a new family hobby that gives many good experiences, but also challenges for Stine and I. Being new exhibitor takes courage, and you often feel on slippery ice. Nevertheless, I am glad that I took up the challenge. It is a personal victory for me when I've been in the ring with our dogs. Exhibition Day is a respite from everyday life. At the same time impressive and highly instructive to look at the experienced exhibitors and their beautiful dogs. There have been so many wonderful experiences with Antony and Monty. The highlight was probably in Odense, where Monty was club junior champion and Stine got great rankings in the junior handling with Antony. I can only encourage other dog owners to get started with the exhibition. Antony and Monty are both gone straight into the heart of me. I have now two faithful little friends who follow me through thick and thin. When I evenings sitting on the sofa, and hear their happy snoring, I am filled with great joy and gratitude. I had never dreamed that a confirmation gift could bring so much good about, and hopefully there waiting several wonderful experiences?